I know how this is going to sound but I need to say it anyway. I’m very good at what I do. Now I feel I need to change. I’ve suspected this had to happen for a while now and the results of last year confirmed it. Last year my senior class achieved truly excellent marks. While there weren’t too many study scores in the elite level, the data that I received from the Victorian Curriculum and Assessment Authority (VCAA) on their performance showed that every one of them exceeded expectations. VCAA take all sorts of data into account when establishing their ‘predicted score’ and basically every student in my class achieved a score that bettered their predicted mark significantly. The stats showed I had a mixed ability class group and together we ‘value added’ in a truly meaningful way. The stats aren’t the full picture though. The results weren’t affirmation of a job well done. They were proof of a need to change. You see, as entertaining, and possibly enlightening, as I know I can be as a teacher, at the end of the day there is still a need for the students to act. For year’s I’ve looked closely at the faces of the students in my class and seen that they are all listening. In fact, year after year the students have taken down the notes, answered my questions, completed the tasks set for them and the results have been generally quite pleasing on the whole. But not all of them have been truly engaged. There has always been a faction that have come to class and done the work out of polite compliance. A group that expect everything to fall into place so long as they turn up, don’t cause a fuss, and churn out what they think I want to see. A group that are not so much lazy students, as they are passive ones. Inevitably their results waver somewhere near the VCAA’s predicted result and, as often as not, drop below it. When I considered the difference between last year’s group and the groups in previous years there was one undeniable factor. That passive faction was absent. The ‘buy in’ from the class of 2013 was the best I’ve ever experienced. It was a mixed ability class like all the others but, this time, they all showed a level of proactivity that raised their individual standards. For me, to be honest, I think that was just the luck of the draw. So it was an experience that made me wonder what I’m doing right and what I should be doing more of. I know I bring energy to my lessons. I know that I can make lessons interesting and even entertaining. I know that I try to engage students in learning. I don’t know that I empower them. Not all of them. 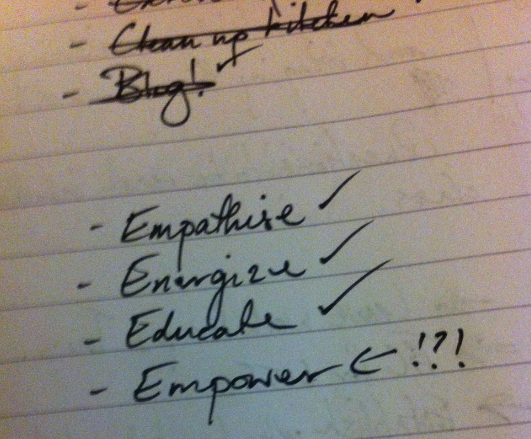 So this year I’ve promised myself I’ll aim to foster empowerment and proactivity in my classes more. Less of the ‘all eyes on me’ front and centre of the classroom routines. More targeted, co-construction in the learning process. The details of what I’m doing will have to wait for the next post but I’ll end with this observation. Two months in and it’s already proven to be difficult, challenging, uncomfortable, and absolutely worthwhile.